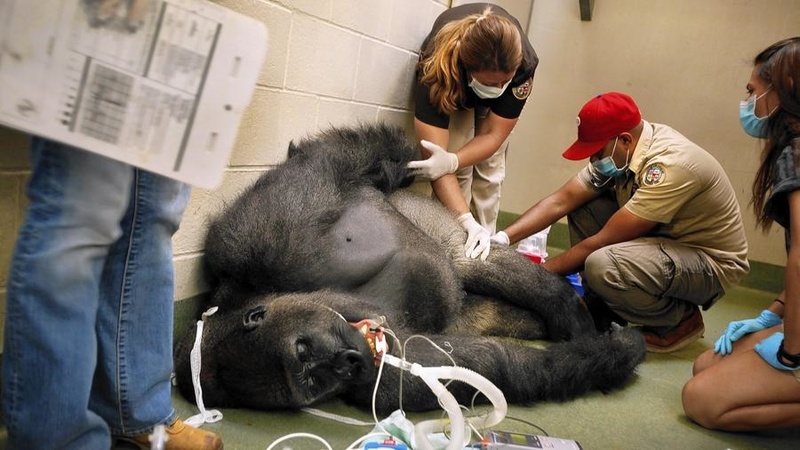 woodworker Archives - HGR Inc.
I’m actually a veterinary technician at the zoo in Los Angeles. I’ve always been an animal lover, and I’ve worked with animals since I was 16. It’s such an exciting and often dangerous job that it keeps me sharp and motivated. Every day is an adventure. I would honestly do it for free, but luckily it pays enough for me to enjoy my other hobbies. 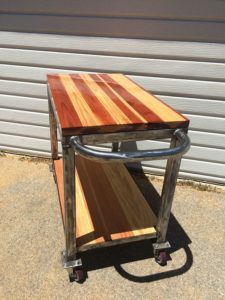 How and why did you get into welding, art and making? Speaking of my other hobbies, many of them center around motorsports. I’ve always enjoyed building fast cars, trucks and bikes. 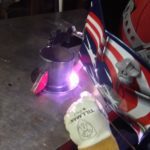 Welding is a necessary skill in fabricating many high-performance parts and “one of” custom setups; so, I had to pick up welding both MIG and TIG along the way. 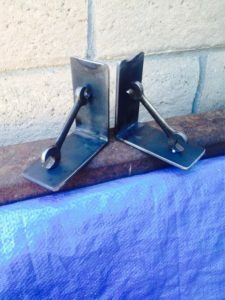 Once I immersed myself in the metal fabrication hobby It quickly developed into a real passion and from it my creative side started to blossom. What types of items do you design and make? I typically design and create industrial-style items, as well as a few more delicate things. 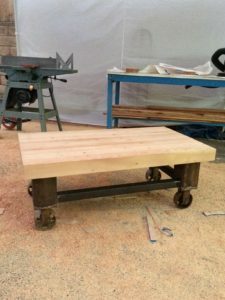 Custom tables are my favorite along with mobile carts and other heavy items. Almost everything I design incorporates a blend of heavy steel and wood. 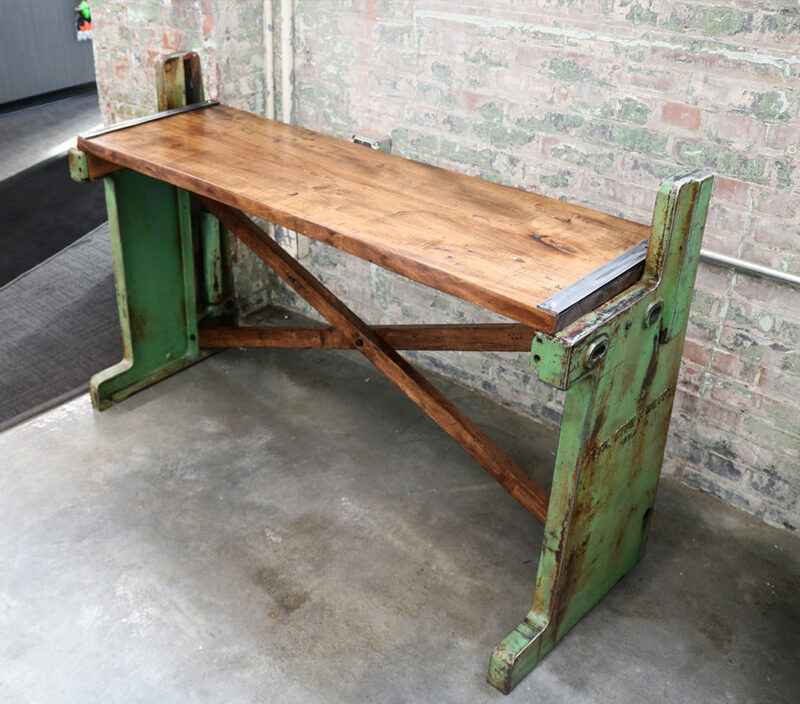 I particularly like building butcher block or farmhouse-style slabs and mounting them on industrial steel frames. I like playing with different wood finishes such as epoxy resins. 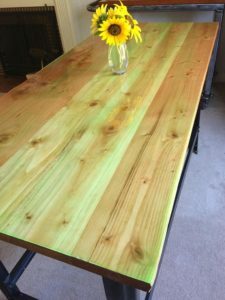 I feel that wood has a warm, deep beauty that is brought to light if the correct finishing technique is used. How do you market or sell your creations? Do you attend shows? I haven’t focused on the marketing or selling aspect too much until recently. This is still mainly a hobby, and I’m constantly learning and improving. 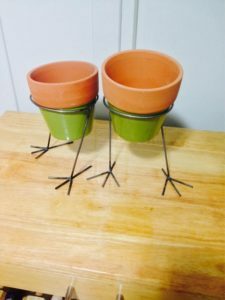 I recently started Red Dogs Crafts, and I currently only have an Etsy website as a marketing tool. I do plan on becoming a vendor at a few local flea markets here in Los Angeles to see if I can find a target audience for my style of fabrication. I plan on attending a few shows to get some ideas of what other fabricators are doing out there. I love seeing new ideas and techniques because it motivates me to learn more. I’m 100-percent self-taught in everything that I do. I’ve never taken classes, had a mentor or worked in the industry to have someone show me the ropes. I believe I’m a fast learner in anything that I do, and I also know that I learn best when I do things on my own by making mistakes and doing my own research on different techniques. Nowadays, with the Internet and YouTube there isn’t anything that you cannot learn online. Heck, there’s even YouTube videos on how to do cardiac surgery for that first timer doing a valve replacement. LOL. My usual mode of action is to buy the tool first then figure out how it works and then practice until I’m proficient at it or at least achieve the end results that I can be proud of. I like Kevin Caron’s work. I think he’s very practical and down to earth with his techniques. He’s also a wealth of knowledge and experience; so, I respect his abilities and his work because he’s constantly learning like the rest of us. He’s also on the WeldingWeb forum where I met HGR for the first time; so, he adds to the knowledge base, as do many other experienced guys. I think I’m inspired by the challenge of creating something that I visualize in my mind and having to physically take the steps to make it materialize to as close a rendition of what I see in my mind’s eye. I feel that many people love certain things but always feel that they’re unattainable either because it’s too difficult, it’s too much work or they just can’t figure out how to do it. I love figuring out how to do new stuff. That is what inspires and motivates me. Whenever I have free time I spend my time pursuing my other hobbies. Typically, I’m out in the deserts of Southern California riding my dirt bikes or drag racing my cars. I think the feeling of being on two wheels ripping through our beautiful landscape gives me the exhilaration that I’m constantly chasing. I also enjoy spending time outdoors at the beach with my two dogs and my girlfriend. Sometimes, I just love my family time staying home with my girlfriend and the dogs just relaxing. What advice do you have for makers? My advice is that you can go as far in this hobby/profession as you choose. It’s all dependent on the effort that you put into it. I would advise anyone starting in the hobby to take classes first. I think this would set you up with a good fundamental foundation which would expose you to the different techniques, tools and options out there which would then allow you to make intelligent choices going forward with the hobby. Being that I’m self-taught, I feel that I’ve gone around in circles a few times and would have wasted less time had I gained the experience a class provides. Also, if you can work in the industry do so, even as a volunteer. It’s invaluable the skill you develop by immersing yourself into the industry. I’ve never been asked this question before so I’ll have to think of one now. I think of life as a journey that is based on choices or decisions. Every decision we make has an effect on the direction that our life takes. If we make good decisions early in life, we are started on a path to success or happiness. I realized the consequences of my decisions in my late 20s and it was at that point that I started in the direction that I’m headed now. My philosophy would probably be something along the lines that life is a constant test of your character. If you make good choices based on good character you’ll be on the path to success and happiness in whatever you pursue. Anything that I missed? The two red dogs? Ah, my babies. 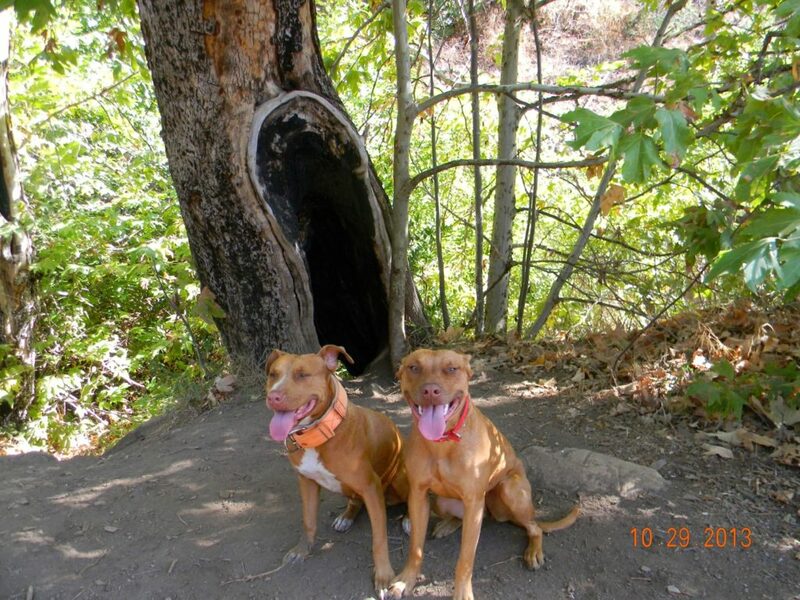 “ShyAnne” and her daughter “Lil Cheese.” These are my two red dogs. A mom and daughter pair that have been part of my life for the last 15 years. ShyAnne has been by my side through thick and thin and good and bad. It’s amazing how having a strong bond with your dogs can keep you positive through so many difficult times in life. These two are a part of everything I do. Hence, I decided to name the fabrication shop after them as they are a part of everything I build. I’m glad to have my workshop at home because it allows me to spend time with my two dogs while I’m building stuff. I take lots of breaks to play ball with them and build cool dog toys to keep them occupied. In return, they only ask for more of my attention, and treats, which I am always glad to give. 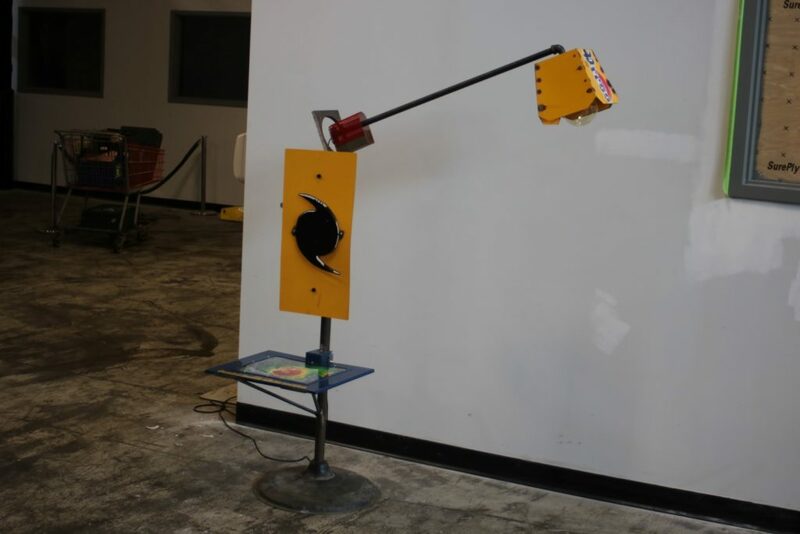 You can own a one-of-a-kind piece of handcrafted furniture by one of Cleveland’s premier contemporary-furniture designers AND help hurricane victims at the same time. You can reach the auction from a button on our home page at hgrinc.com or go directly to the landing page here to read about the arts organization that will benefit from the auctions. 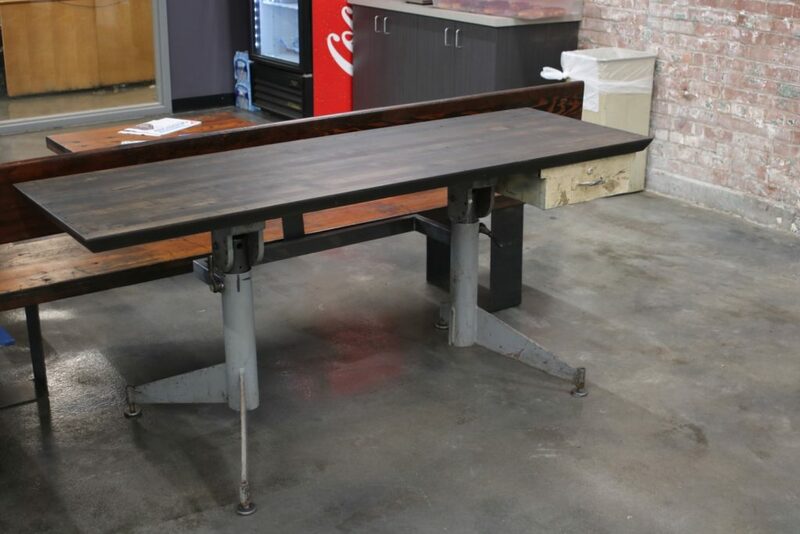 To learn more about 44 Steel’s desk, click here. For info about Rust, Dust & Other 4 Letter Words’ lamp table, click here. For info about 3 Barn Doors, click here. Help hurricane victims recover, and gain a conversation piece for your home or office.